Our fall-planted garden of flowers and vegetables hooped and covered with row covers. They winter over becoming well-established to hit spring at full steam ahead! I am often asked how I use row covers on my farm. Below are the reasons to use, how to use, and when to remove. In all installation during warm-to-hot weather hoops are recommended to create more air space under the cover. I use the lightweight floating row cover because it is the most versatile. If I have a need for more protection (colder temperatures) I double the cover. the winter and spring. Just imagine if the plants had to take that wind. Cover fall, winter and early spring plantings of flowers, herbs, and vegetables. Use hoops and floating row cover (no plastic) that are super easy to install and maintain. 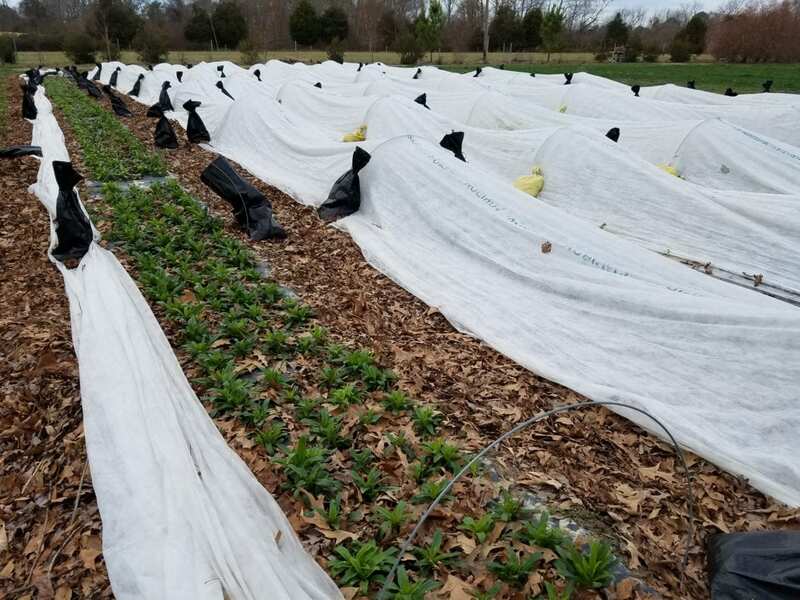 Because these plants are cool season hardy annuals they don’t need cold protection–although they appreciate it– we use it for wind and deer protection. Cover in fall when nighttime temperatures begin dropping below 32 degrees. 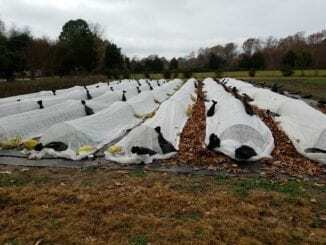 If a run of several warm days comes during winter that go above 55 degree, temporarily uncover to prevent encouraging plants to grow to big before their time. Recover when freezing weather returns. Uncover in early spring when the threat of hard freezes has passed. Pull covers off and leave in garden for just in case until only above freezing is expected. Some crops like beans, squash, asters, and others can be protected from pests for a good portion of their growing time in the garden with a row cover. The important step is covering immediately at planting time. Plant the crop in a spot that has not previously had the pest you are trying to prevent. Hoop and cover with a floating row cover and leave it on 24/7 except when tending the bed. When the plants begin to bloom remove the cover. This allows pollination. If and when the pest arrives it is usually in low enough numbers to not cause significant damage. It’s the eggs they lay that cause such damage and laying so late in a crop doesn’t usually give them time to evolve. Floating row covers are great for protection from birds, rabbits, squirrels, and deer. Covering the plantings like strawberries, seedlings, and others immediately protect from damage. The creatures literally don’t even realize they are under there. A transplanted bed uncovered for a warm winter’s day weeding. 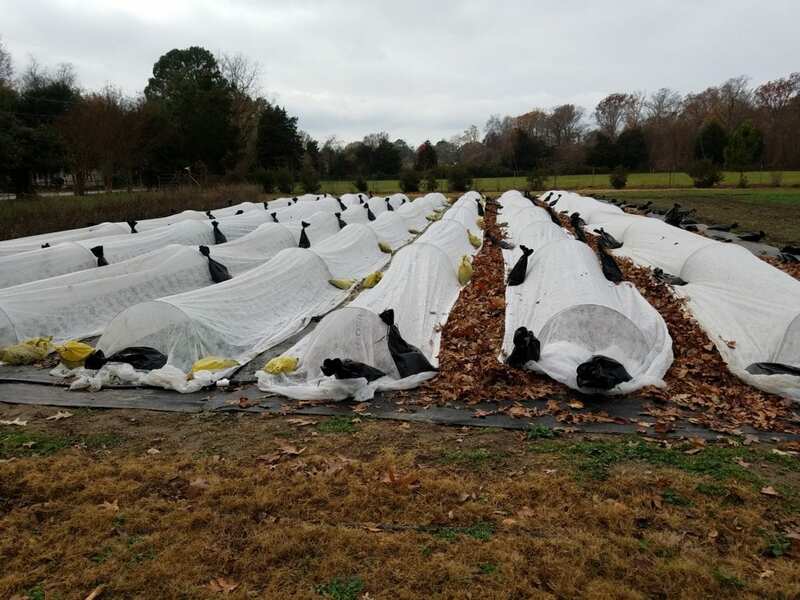 Covering a seed or transplant bed at planting will retain moisture, protect from wind, and protect from pests and varmints. Seed beds will have a higher germination rate because of more consistent moisture and transplants will establish faster. Seed beds can be covered without hoops. The germinating seeds may bend a little under the cover but will quickly straighten once removed. I like to hoop and cover transplant beds for the best results. Remove the cover from seed bed when the seedlings are 4-8” tall and can be mulched. Transplant beds can be removed anytime after established. Lisa Mason Ziegler is a commercial cut-flower farmer in Newport News, Virginia. She is a leader in the flower farming industry, author, accomplished speaker and the owner of The Gardener’s Workshop. Lisa has authored three books: The Easy Cut Flower Garden, Cool Flowers, and Vegetables Love Flowers. Learn about Lisa’s online courses! Join us on Facebook and keep up with the farm! I keep trying to use row covers, but the wind here just tears them apart. I roll the edges so there is more strength, and use a bucket full of earth staples, but it just doesn’t survive more than a week or two… any other advice? I use 4’ cattle fence and cut it into 6’ sections as my hoops. Then I place the row cover over it and tie the ends to the fence wires. This allows me to move them around the garden and also to store them in the shed in the winter if I am not using them. I started using them for my lettuce and spinach so I could grow it all summer. I like being able to move it and you don’t need anchors, you just push it into the soil. It may not work on huge areas, but I use it in my garden with great success. To combat the wind in North Texas, I roll the “permanent” side edges on one side around 12″ 2x4s. The side I open when needed is rolled around 7′ T posts. Because of our wind, rain, snow and ice, I replaced the hoops with arches of hog wire, 4 feet long and 5′ diameter. They are secured with 24″ rebar topped with practice ping pong balls for safety and to prevent tearing the covers.